Voters in Germany's most populous state are going to the polls in an election seen as a crucial test for Chancellor Angela Merkel. 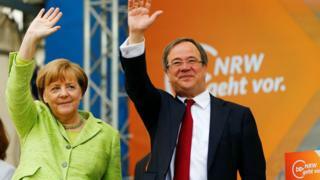 Polls show Mrs Merkel's centre-right Christian Democrats (CDU) could unseat the centre-left Social Democrats (SPD) in North Rhine-Westphalia. The SPD has run the state for most of the post-war period. A CDU victory would be a boost for Mrs Merkel as she seeks a fourth term in national elections in September. SPD leader Martin Schulz has predicted that if they win in North Rhine-Westphalia (NRW) he will become Germany's next chancellor. The SPD are currently junior partners in Germany's governing coalition. But the BBC's Jenny Hill in Berlin says the party has been slipping in opinion polls and Mr Schulz may live to regret his forecast. Polls ahead of Sunday's vote put the two parties neck-and-neck. The CDU's campaign has targeted voters' frustration on issues such as traffic congestion, rising crime and education. "Being stuck in traffic is time from people's lives," Mrs Merkel said while campaigning recently. "When you add all the time up over a year, it has become a huge amount of time for commuters." The CDU has also promised to beef up security with longer prison terms for offenders and more funds for the police. But state Premier Hannelore Kraft accused Mrs Merkel of ignoring the SPD's achievements on security, telling the broadcaster WDR: "She is an unworthy chancellor." Mrs Kraft has governed NRW since 2010 in coalition with the Greens. But the Greens have seen their support more than halve, making it difficult for the SPD to muster a coalition.